Worldwide Biblical Zionists (WBZ) is a project of World Likud and its evangelical arm, World Evangelical Zionists. It was developed to aid Christian Zionists who wish to make aliyah (move to Israel) with the stated goal of providing assistance for housing, employment, legal services, and pre-military training. 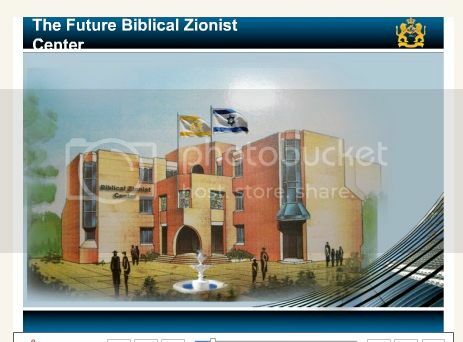 To the right is a graphic of the planned Strategic Biblical Zionist Center. Israeli Ambassador Michael Oren, and other apologists for the partnership with Christian Zionists, speak frequently of the generations of support for Israel by "restorationists." They fail to acknowledge the dark side of this history, and the potential future consequences as Christian Zionists become increasingly aggressive in trying to move the hand of the prophetic clock. Danny Danon (also transliterated from Hebrew as Dannon) is head of World Likud, founded as an umbrella organization for international Likud branches. Danon challenged Netanyahu for head of the Likud party in internal party primaries in 2007, since Danon viewed Netanyahu as "moving to a centrist view to pander to votes." Danon was recently polled as the Knesset's "most loyal to the right-wing's agenda." above: Danny Danon (left) with Ron Nachman, founder and mayor of Ariel, and John Hagee. Ariel is one of the larger settlements on the West Bank and is called the "Capital of Samara"
above: The Billye Brim pool and the John Hagee Building in Ariel are named for their benefactors. Brim is a director in Hagee's Christians United for Israel. Christian Zionist financial support for the West Bank has been ongoing for years, and Ariel has been a favorite for donors and adopt-a-settlement programs marketed to churches. However, some Likud party members and Christian Zionists are now taking even more extraordinary measures to populate the West Bank, showing just how far the concept of Christian Zionism can be taken. In January, 2007, Christian Zionist Joel Bell became director of the World Evangelical Zionists (WEZ), the evangelical department of World Likud. Bell states that in June of 2007 the "Jewish Zionist Congress and other Zionist organizations began supporting WEZ's affiliation. This launched Biblical Zionists activities together with Governmental Institutions." A joint Board of Governors Conference with WEZ and World Likud leaders was held in Texas in July 2007, and a new organization was launched in November under the under the name Worldwide Biblical Zionists. Danon and Bell were joined as keynote speakers at the Texas conference by Sagiv Assulin of Likud, and Christian Zionists William Koenig, former White House correspondent in the George W. Bush administration. Morton Klein of ZOA was also listed as a speaker in the promotional materials including this flash presentation. Other guest speakers listed in the promotional material were Keith and Jodie Anderson. Jodie Anderson heads the Battalion of Deborah, an organization which works with the Knesset's Christian Allies Caucus and has, according to Public Research Associates' RightWeb, received funds from Irving Moskowitz. "We actively develop opportunities through partnership for your participation here in Israel. Investments, jobs, housing, education, military training, community service, and tools you'll need to make Israel your home." We are a grassroots movement to preserve Jewish lives, bring the lost tribes of Israel home, build in Judea, Samaria, the Golan Heights, Negev, Giled and Lebanon, and to prepare for the Great and Awesome day of Elohim. "being established for Biblical Zionists to come to Israel and experience a 1 year training course with experienced IDF military teachers." Regional WBZ coordinators have been chosen for various areas of the world including the U.S., U.K., and several African nations. One of the U.S. regional directors, Bob Erhardt sent out letters calling for donations to the campaign for Sagiv Assulin in the past Israeli elections. "Specifically on November 16 at the World Wide Biblical Zionists inauguration ceremony, some top Likud Party members attended and addressed the approximately 300 attendees. Those speaking to us were Ayoob Kara, Ullie Edelstein, Gideon Saar, and Sagiv Assulin... Support Sagiv Assulin by donating to his campaign.... Listen to Sagiv's heart as he addresses both Ephraim and Judah at the WBZ inauguration ceremony." The original link is no longer active but the letter can be seen at Rotterdam4Israel. The Ephraim reference in the letter means Christian Zionists who view themselves as Israelites with rights to the land of Israel. They believe themselves to be joint heirs to Israel with Judah, referring to Jews, and describe themselves as Ephraimites or the "two-house" movement. The two-house movement is a growing phenomenon with some similarities to the British or Anglo-Israelism which was popular in 19th and early 20th century Britain and migrated to the United States. In British Israelism the British and American "Israelites" were considered to be of the house of Manasseh and Ephraim (the sons of Joseph). In this belief system Anglo-Saxons, Celts, and often Germanic and Scandinavians, were considered to be the lost tribes of Israel, and therefore shared hereditary rights as Israelites with Judah, or Jews. The British-Israel-World Federation recently celebrated its 90th anniversary. This belief system was not limited to particular denominations and migrated around the globe. In the United States British Israelism impacted a number of emerging sects of Christianity in varying degrees, including Herbert Armstrong's Worldwide Church of God. Over time, some British Israelites rejected the participation of their "brother Judah" and became fiercely anti-Semitic. This further mutated into Christian Identity, the belief system of many of the white supremacist groups in the U.S. They believe that they are Israelites and that Jews are impostors in the family tree. Christian Identity spawned Aryan Nations, Posse Comitatus, Phineas Priesthood, and The Order. Many Christian Identity groups celebrate their own versions of Jewish holidays, like the Feast of Tabernacles, and use Hebrew terms and symbolism, since they believe themselves to be Israel. The Christian Identity belief that Jews are Esau-Edomites who have fraudulently infiltrated the house of Judah and control the world through demonic means, is found throughout a wide variety of overt anti-Semitic material. The Ephraimite beliefs are markedly different from those of British Israelism in a significant way, although they share the belief that they are Israel. The Ephraimites are multi-racial and multi-ethnic and therefore clearly not white supremacist. Recent Ephraimite conventions in the U.S. have included members from around the globe, connected not by race but what is sometimes described as "spiritual DNA." In this movement the term "restoration of all Israel" includes Christian Ephraimites but also includes Jews who are willing to pursue "God's plan for Israel." There has been negligible publicity about the Ephraimites with the exception of a 2005 article in the Cleveland Jewish Times [see reprint of article here.] However, this article was published prior to the development of Worldwide Biblical Zionists and the outreach by Likud members to some of the Ephraimite groups. The group headed by Angus and Batya Wootten report that they petitioned the Israeli government for their rights to "Judea and Samaria." They have also reported contacts with Sagiv Assulin of Likud, one of the participants in the founding of WBZ. The Woottens' organization is called the Messianic Israel Alliance, but is predominately composed of Christian Ephraimites. "SOS Israel, an umbrella group of Jewish settlers now living in Judea and Samaria has said that in fulfillment of their biblical mandate they will declare a new Jewish state independent of Israel. They believe in light of the 2005 uprooting of more than 8,000 Jews from the Gaza Strip, the time has clearly come for the Jews of Judea and Samaria to prepare to secede from Israel and establish their own autonomous state. They have already launched a contest to choose a flag and national anthem for the new state." "Another group of concerned Jews held a preparatory conference concerning the Sovereignty of the Jewish Nation over the Jewish State, in Jerusalem, on November 28, 2007. Their objective is to form a New Jewish Congress that will eventually gain sovereignty of the Jewish Nation over the secular state." "What these groups are saying is, the Jewish Nation and the government of the Secular Jewish State are different entities. And just as the government of the present Secular Jewish State does not represent the Jewish Nation, it also does not represent Ephraim, the other house of Israel, and therefore it does not represent the Nation of Israel. Maybe it is time that Ephraim considers how he can be represented in a government which has sovereignty over the land of Israel." "To accomplish this representation Ephraim needs to work towards the restoration of the nation of Israel. This goal would be accomplished by uniting the House of Judah and his companions and the House of Joseph, and his companions, into one sovereign nation in which each tribe has an equal inheritance in Eretz-Israel." In February 2008, Wootten describes the working relationship developed with Sagiv Assulin through Ephraim Frank, an Ephraimite who has moved to Israel. Frank is the author of Return to the Land - An Ephraimite's Journey Home. This link is to Key of David Publishing, the publishing arm of the Messianic Israel Alliance. The Woottens' Messianic Israel Alliance is just one of several Christian Zionist groups which have shown interest in moving to Israel and the West Bank. WBZ appears to have stumbled in its early stages due to a parting of the ways between director Joel Bell and well known "two-house" leaders in the U.S., Eddie Chumney and Monte Judah. However, WBZ is an excellent example of how far Christian Zionism is willing to go to move the hand of the prophetic clock. Those having second thoughts about this partnership now include Likud party's Moshe Feiglin who is well known for his extreme right wing political positions. (He has been compared to Meir Kahane and is about as far removed from J Street as one can imagine.) He was the founder of Zo Artzeinu, in protest of the Oslo Accords, and the Manhigut Yehudit faction of Likud. He had previously worked with Christian Zionists, but Feiglin has recently written in the Jewish Press about the dangers of this relationship, motivated, it appears, by his rejection of the World Likud partnership with Joel Bell. "The Christian conquest is much more dangerous than the Muslim conquest because it is not direct. It is not violent. Embracing and supportive, it connects with Israel against the Muslim enemy. It supports a Jewish Land of Israel in its entirety - even speaking up for the sanctity of the connection between the Nation of Israel, the Land of Israel and the Torah of Israel. It just forgets to specify which Nation of Israel and which Torah." Both Feiglin's disillusionment expressed in the Jewish Press article, and the horrific screed posted in the comment section in which Jews are described as "atheistic" and "stiff-necked," show the dangers of an Israeli/Christian Zionist partnership built between two extreme right entities, and based on false pretenses. What we see taking place today is not passively waiting for a Messiah and then determining who was right, as Jewish leaders joke when they are defending Christian Zionists. These are groups of activist who are working to make their prophesied millennial utopias a reality, as quickly as possible. The relationship between two entities can not be sustained as their goals diverge, and the fallout threatens Christian and Jewish relations everywhere. The longer this "match made in heaven" between Christian millennialists and right wing Israeli and Jewish leaders goes on, the uglier the divorce is going to be. Ms. Tabachnick. I fear that the money being waved around is what keeps their marriage intact. With all due respect for a different opinion, I believe the middle east is not about to get any better, as religion is only one of the core root reasons things are in flames at this time. It will take another decade at least before we can expect any sort of peace treaty to be not only implemented, but also enforced. With Arafat gone, it's time for Israeli replacement as well, as perhaps new leaders might bring peace to this troubled region.